Like stir-frying, steaming vegetables also preserves nutrients that would be lost when boiled. The colors stay bright, flavors are sweet and fresh and, if you are trying to cut back on fats, no oil or butter is used – just swirling steam. Many times they can be topped with simple, herb based seasonings or sauces to add flavor and stimulate your palette. 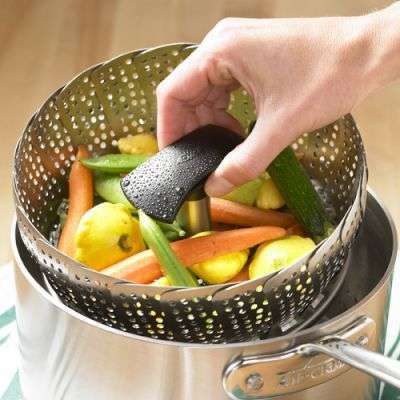 To steam vegetables you will need some basic equipment. One of the simplest, and least expensive, is a metal steaming basket as shown to the right. Some are collapsible and will adjust to the size of your pot, others are more solid and rest inside. 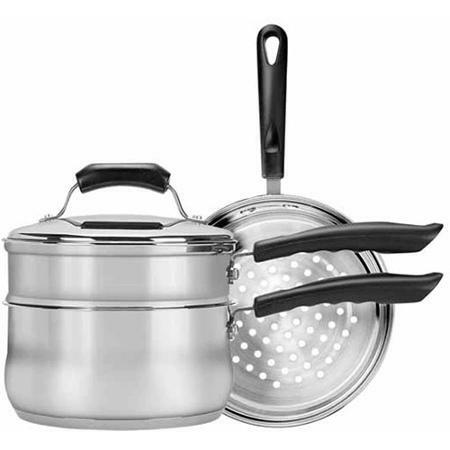 Some double boilers have a steamer pot option that sits on top. 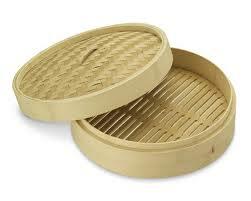 And if you want to use your wok for steaming you may use a bamboo steaming basket. Any of them will accomplish the task beautifully. To steam, fill the bottom of the pot with about 1″ to 1.5″ of water, making sure that it doesn’t touch the bottom of the rack. Bring the water to a boil over high heat then place the vegetables in the rack. Cover and reduce to medium heat and begin timing. The water should be boiling the entire time. Check the level occasionally and add more water if needed. How long you need to cook the vegetables will depend on their freshness and maturity of the vegetables. 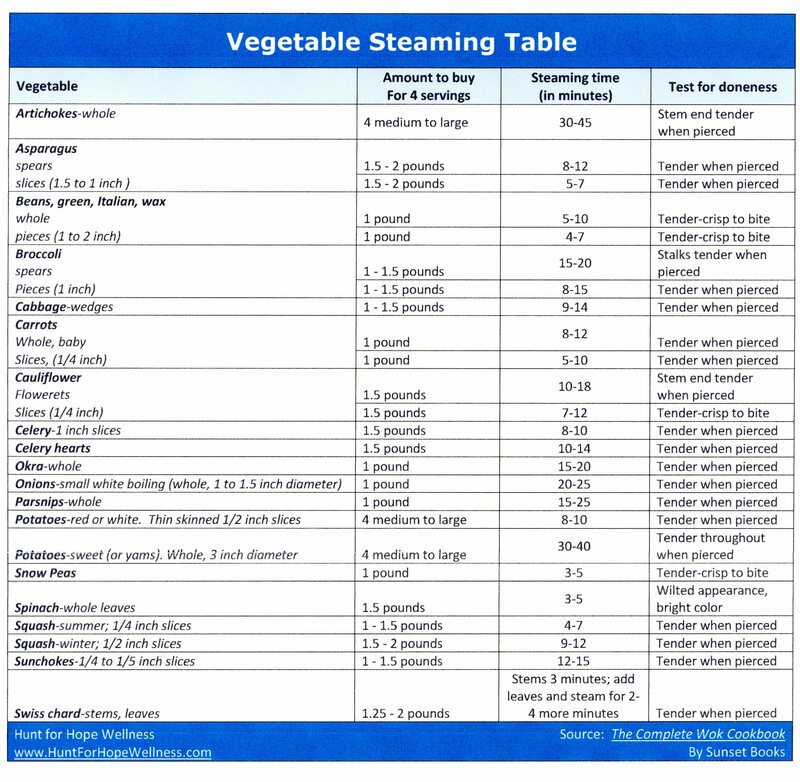 It is best to steam one type of vegetable at a time but if time and space is limited refer to the steaming chart below and put the firmer vegetables in first then follow with those that are softer or more tender at the appropriate interval so that all are cooked and ready at the same time. You may test after the minimum cooking time by tasting or using a fork to determine their tenderness. If still to firm, continue to cook and test frequently until they are done to your liking. Most cooked vegetables should be just tender when pierced. Whole potatoes should be tender throughou8t and leafy vegetables should be wilted and have a bright color. When they turn dark, they are overcooked. Below is a chart of quantities of vegetables and their recommended cooking times. It may take a little experimentation but steaming vegetables will add variety to your meals and preserve valuable nutrients. Use this handy Vegetable Steaming Table for perfectly cooked veggies every time! 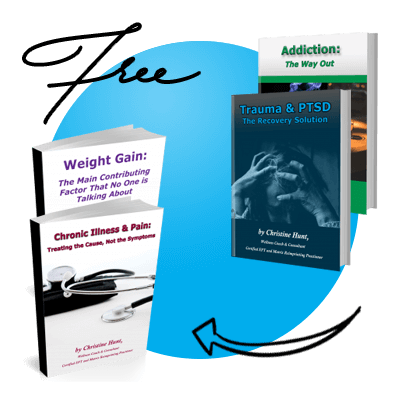 If you would like a .pdf file of this table, please fill out this form to download it.